The software, as well as all related licenses and support products, are only available through Open-E's most experienced partners. Each partner offers specially trained staff: JovianDSS Certified Engineers. With this strategy, we can ensure that customers are supported on every step of the way: from the initial installation to daily business. 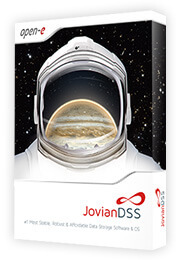 Open-E JovianDSS delivers software defined storage which results in a wide variety of different hardware requirements such as performance range, capacity capability, and connectivity. To ensure compatibility and robust storage environments, all selected partners offer storage systems which are tested, benchmarked and certified by Open-E. This way, customers are able to use solutions that require exceptional security and redundancy, without compromising performance. Copyright © Open-E NAS iSCSI SAN FC ストレージソフトウェア. All rights reserved.